Travelling to Corsica is a dream. And it's so easy to make true! Simply take a plane from most airports in mainland France or ferries from Nice or Marseille. The Island of Beauty awaits you within hours. Of course you want to go to Corsica, but you need to plan your travel and ensure you can reserve your accommodation with full peace of mind. Advance booking is a must in summer. Travelling to Corsica is something to be carefully prepared, so you get the best from your stay in the island. Depending on the travel and routes you've chosen, you'll select the most suitable accommodation, from rental to bed and breakfast or campsites. Travelling to Corsica means glorious landscapes. And that's no bad reason to go! Because the tourist sites are utterly amazing. You knew that. But you can do more. You can go deeper into the cultural influences that have made this island what it is today, built up by generations of workers of the land, of architects and stone masons, builders of charming villages and houses. Those who live in them today, your hosts, are ready to tell you the stories of their island past as you gather round the table for supper in the evening. There are two Corsicas. There's the Corsica of the beaches. But there's another more secret and more subtle Corsica, full of inner meaning. It's a state of mind, the repository of an age old culture. But and this is the island miracle there's never a shadow of conflict between the two Corsicas. The invitation is open! Enjoy one, or the other, or both Corsicas to the full. 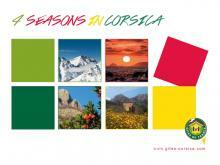 Travelling to Corsica? Looking for rentals on the West Coast? In Bonifacio, in Cap Corse? Look up Gîtes de France Corse, the best guide to the countryside and to the cultural events that are truly typical of the authentic Corsica.